New data has been added to the Register of those who served in the Anglo Boer War from 1899 to 1902. It now contains the names for the Royal Navy, Royal Marine Light Infantry, Royal Marine Artillery, Royal Indian Marine and local staff who earned medals assisting the Royal Navy. 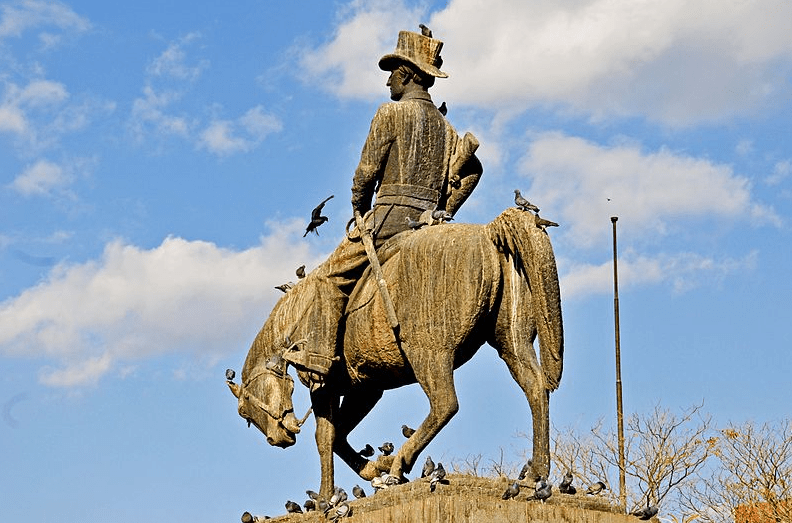 How did the Anglo Boer War arise? 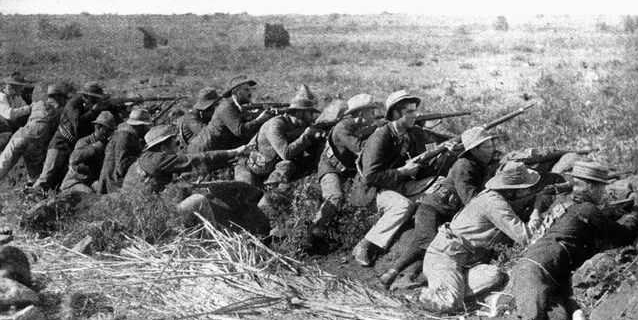 The Anglo Boer Wars were a major conflict at the end of the 19th century but many of us have little idea as to what caused the British to be at war in the southern most part of the African continent. The Cape Colony had originally been part of the Dutch colonial empire but in 1815, the British had their eyes on Simontown, a vital port on route to India and the wealth that went with it. All the British really wanted was the port, they had little interest in the extensive land that went with it, nor in the problems it might bring with the indigenous population. The Boers numbered about 25,000 in the Cape Colony. They used the indigenous black population as slaves on their farms. When Britain abolished slavery in 1833, the Boers were outraged and fundamentally disagreed with the liberal movement behind emancipation. They also wanted compensation from the British Government for their losses. Little was forthcoming. The Boers also wanted to take military action against the Xhosa tribe and for a while they had the support of the local British Governor of the Cape, Sir Benjamin d’Urban. He annexed some Xhosa territory but Britain did not want to extend the lands in the Cape and d’Urban was forced to restore it to the Xhosa. This further outraged the Boer and a divide opened up between the British and the Boers about their relations with the native black population. The Boers resolved the problem in 1836 by undertaking what is now known as the Great Trek, to seek a new home in the Veld. The Boers themselves split into different factions but one large group settled in Natal on the East coast. Here they came up against the Zulus with whom they fought and triumphed but their victory was short lived as the British had no intention of allowing the Dutch settlers control of the coastline and in 1843 they annexed Natal to the British crown. Other settlements such as the Orange Free State were more successful. The fear the British Government had about the Cape Colony was the cost of running it and they sought to make the colony self governing. In 1853 two elected Houses of Parliament were set up. Caught up in all of this was the necessity of recognizing the independence of the Boer States of Transvaal and Orange Free State but they had to agree that there would be no slavery under their rule. Not all Boers wanted independence from Britain but Britain could not suffer the costs of defending the Boers against the Xhosa or the Zulu. So a complex arrangement was made, the British and the Boers formed the European part of South Africa whilst being surrounded by Xhosa and Zulu who were not happy with their presence. British Governor of the Cape Colony in 1853, was a man called Sir George Grey who sought peace between the white settlers and the Xhosa. He placed many of the Xhosa lands under the protection of the British Government. He also wanted a Federation of South Africa were the rule could be shared between the British and the Boer. His work was not supported by the British Government and dissent between the groups festered away. When Britain later sought to annex Transvaal in 1867 it was met with fierce opposition from the Boers and the First Boer War broke out in 1880. An uneasy peace broke out which collapsed as it became apparent that the voice of the Boers in the Transvaal was becoming more nationalistic and what they wanted was a united South Africa under the Afrikaaners. The ensuing political debacle ended with Britain rejecting various ultimatums from the Boers and the two were at war again. In addition to medal entitlement, much more information that can be seen in The Register, including, casualties, honours and awards, miscellaneous references, biographical notes and if the medals have been seen on the open market. You can also use The Register to find missing medals. Simply buy the record you are interested in and you will be notified of all updates. In total there are now 292,487 records on The Register as well as much background information about the Boer Wars themselves. South African History Online is an absorbing website that clearly describes the growth and development of South Africa and the part that the British played in it’s history.